Framing Indian Power and Foreign Policy: State vs. Center? Or Rights vs. Realism? On Friday, November 15, the biennial Commonwealth Heads of Government Meeting (CHOGM) convenes in Sri Lanka. This year’s gathering of fifty-three Commonwealth members has been anything but routine, however. A number of countries have had heated internal debates about their attendance and its intended signals; three have elected to send delegations below the “head of government” level as a way to highlight concerns about Sri Lanka’s limited progress on post-conflict reconciliation, human rights and democracy, and accountability for violations at the 2009 end of the nearly thirty-year conflict with the Liberation Tigers of Tamil Eelam (LTTE). Canadian Prime Minister Stephen Harper issued a public statement explaining his decision to skip this year’s CHOGM by noting deep concern over Sri Lanka’s failure “to uphold the Commonwealth’s core values.” Earlier this week, the prime minister of Mauritius followed suit, stating that his decision rested on the “absence of progress in Sri Lanka on the respect of human rights.” The UK announced some months ago that the queen would not be able to attend for the first time in forty years, and Prime Minister David Cameron has publicly stated that he will bring a “tough message” to his interactions with Sri Lankan President Mahinda Rajapaksa. (The Sri Lankan government has bristled in response, stating that Cameron cannot “just make a demand from Sri Lanka”). In Australia, a vocal public debate has included criticism of Prime Minister Tony Abbot’s decision to attend, and some have called for a boycott entirely. Malaysia has witnessed a similar debate as well. These debates have been framed entirely in terms of national interests in supporting human rights and democracy—and all these countries have substantial Tamil minority populations. India—the country with the biggest stake in this question due to proximity and historic links—has had a heated and very public debate for weeks over whether the prime minister should head the Indian delegation. He will not, and India will be represented at the foreign minister level. But the framing of this debate in the Indian context has been strikingly different from that of other countries. The southern Indian state of Tamil Nadu—home to some 70 million Indian Tamils and a long-term host to Tamil refugees from Sri Lanka—has been understandably focused on the situation. The Tamil Nadu state assembly has passed two resolutions in recent weeks calling for India to boycott CHOGM entirely. But a state assembly does not make decisions about foreign policy for the central government. Back in Delhi, deliberation has unfolded over many weeks, with some of India’s senior ministers and leading commentators weighing in on both sides, with strong voices in favor as well as against a prime ministerial-level visit. 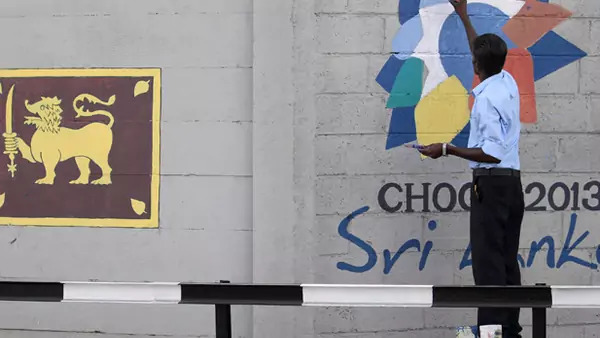 India’s realists voice the important concern that a delegation downgrade may not further Indian influence in Sri Lanka, and may actually serve to lessen Indian sway over Colombo, which would not advance Indian interests. Voices against a PM-led CHOGM delegation have focused on the unmet promises of devolution of power in Sri Lanka and noted grave concerns for the human rights situation, similar to the concerns voiced in other countries. But the political dimension of the debate in India has been the real headline there, with the argument framed as one of domestic politics versus national interests. Coalition dynamics and the support of Tamil parties for the central government have been the focus, especially against the backdrop of related foreign policy debates over India’s votes in the 2012 and 2013 UN Human Rights Council resolutions on Sri Lanka, the latter of which resulted in a split between the central government and one of its coalition partners, the Tamil Nadu-based Dravida Munnetra Kazagham (DMK). The DMK in fact withdrew from the central coalition in March over a demand for India to seek a stronger resolution (even though India voted in favor of the resolution, which called upon the Government of Sri Lanka to do more in implementing its own Lessons Learnt and Reconciliation Commission recommendations). So because the question of coalition maintenance has had urgent political relevance, the CHOGM debate has played out as “state versus center” with the state-level interests as inherently more narrow (and therefore less in India’s larger national interests). There’s another way to view this. The same debate could also be framed as one of rights versus realism, with a focus instead on when and where India’s national interests are best advanced by emphasizing human rights and democracy in foreign policy. That’s an important debate to have, especially given India’s example as an inclusive, religiously pluralistic, multiethnic and multilingual democracy. But framing a conversation about Indian foreign policy and the role of democracy and human rights in weighing national interests to something that seems like a narrow, single-state concern, a critically important aspect of Indian power and leadership gets obscured. How India chooses to prioritize democracy and human rights in foreign policy will be a debate with many facets that will inevitably recur—and it is one well worth having head-on.